Goodnight Mommy / Ich seh, Ich seh (2014, Austria, dirs. Veronika Franz, Severin Fiala)—The horror genre has made me completely distrust corn fields. The minute Goodnight Mommy starts with nine-year-old twin brothers Elias and Lukas (played by the eponymous Schwarz brothers) playing hide-and-seek in the corn fields that flank their lonely country house—with woods stretching off to the distance on the other side—my skin began to crawl. The expansive landscape felt claustrophobic and insular, a trap. Then I began to calm down as the truly adorable Elias and Lukas are shown jumping up and down on a trampoline in the rain, running through the woods, catching big beetles for their bug collection, saving a stray cat from an ossuary, and sharing whispered secrets by flashlight underneath their bedcovers. But then there’s the problem of mother. She’s returned home from the hospital with extensive facial surgery, her head wrapped in bandages, her eyes swollen and bloodshot, and she’s different than before, short on patience, stern, changing all the house rules and not for the better. Elias and Lukas begin to wonder: Is she really their mother? And set out to test her. Produced by Ulrich Seidl, it’s to be expected that Goodnight Mommy will transform into a dark, existential struggle for identity and fundamental trust—what Fantasia programmer Mitch Davis describes “as a profoundly disturbing work of macabre beauty and black poetics, of unspeakable horror and scorching psychological hurt” —proving yet again that no one can hurt you as much as your own family. IMDb. At Variety, Peter Debruge says Austrian newcomers Franz and Fiala have created an "elegantly stylized, thoroughly unnerving attempt to creep the heck out of arthouse horror fans" and "a home-invasion scenario where the aggressors lived there all along." David Rooney's bottom line at The Hollywood Reporter: "Even Joan Crawford didn't have these kinds of parenting problems." Both liken the film to Michael Haneke's Funny Games (1997). Rooney adds that "this insidious tale of a mother-son bond gone haywire is squirm-inducing stuff" and has "cult potential stamped all over it." At The Guardian, Peter Bradshaw likewise references Haneke, and includes Jessica Hausner's Hotel (2004) as a comparison. His main critique: "Perhaps a more unassuming genre director would have tightened this movie's cables a little, so that it had more tension and less revulsion. At all events, it delivers some nasty shocks." Goodnight Mommy - Trailer from Films Distribution on Vimeo. 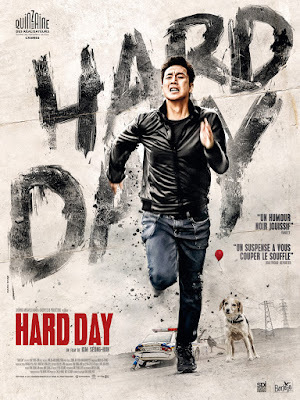 A Hard Day / Kkeutkkaji Ganda (2014, South Korea, dir. Kim Seong-hun)—As synopsized by Fantasia: “Homicide detective Ko Gun-su is having a hard day. His mother has just died, and he and his colleagues are being investigated by the internal affairs over bribery charges. Then on his way to his mother's funeral, he drives recklessly and commits a fatal hit and run. He tries to cover-up the accident by hiding the man's corpse in his deceased mother's coffin. But someone has been watching all along, and Gun-su gets a mysterious call from a person claiming that he was the sole witness to the crime, who now begins to blackmail him." Official site. IMDb. Wikipedia. In his program capsule, Nicolas Archambault promises that A Hard Day "contains everything that contemporary Korean cinema is reputed for, including intense chase scenes, strikingly realistic tussles, biting dark humor, corrupt anti-heroes and glorious production values. No wonder this instant classic received a standing ovation from the notoriously difficult Cannes crowd. If the film is largely carried upon the shoulders of actors Lee Sun-kyun (Our Sunhi, 2013) and Cho Jin-woong (Hwayi: A Monster Boy, 2013), dead-set in an intense duel, it is Kim Seong-hun's impeccable direction and bullet-speed script that steal the show, marking him as one of the most promising emerging Korean filmmakers." At Variety, Maggie Lee states that Seong-hun handles "a taut yet elaborately plotted narrative with poise, control and near-faultless technical execution." At The Hollywood Reporter, Stephen Dalton claims A Hard Day provided Cannes "a masterclass in throat-squeezing, stomach-knotting suspense" and a narrative "full of smart surprises and darkly funny lurches." Catching the film at the recent San Francisco International Film Festival, Tony An enthuses at Ynot At the Movies: "The film's sense of humor is simply irresistible." I haven’t much more to add other than that this is all absolutely true. A thoroughly rousing, crowd-pleasing cat-and-mouse chase that will leave you gasping and laughing in the same breath, if you haven’t already fallen off the edge of your seat. Børning (2014, Norway, dir. 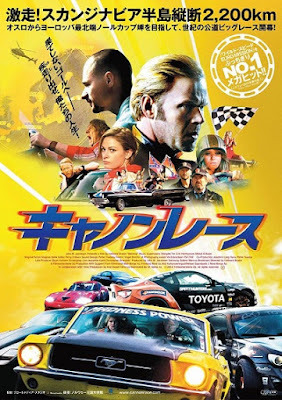 Hallvard Bræin)—Another film to buckle in for (it’s the law, afterall) is this formulaic car race that guffaws its way across the length of Norway, offering some spectacular views of the countryside underneath the roar of engines and screeching wheels. Fantasia claims Børning is "faster than Cannonball Run and funnier than Smokey and the Bandit", and it certainly boasts its share of speed and telegraphed jokes, sleek cars and hot babes, but I really wish there would have been a hunk or two to distract me from the obvious and the cloying sentimentality of a father trying to communicate with his estranged daughter. North American Premiere. IMDb. Facebook.